According to one RSNA 2010 attendee, there were so many people touting vender-neutral archive (VNA) products, it seemed as though you could walk into a Walgreen’s and buy one. While the surge of interest in VNAs was evident, what was less obvious was what constitutes a true VNA. The answer to that question depends on whom you ask. Although a consensus has yet to crystallize, a couple generalizations apply. Koller says a true VNA should be able to store and retrieve data from any PACS vendor and transparently migrate between storage platforms from any storage vendor utilizing any storage technology as cost-effectively and painlessly as possible. This approach has some advantages over proprietary storage solutions. The most immediate one is that it allows medical facilities more flexibility in changing PACS vendors. Typically, switching vendors means swallowing hard and gritting teeth because of the messy data migration that’s required. VNAs provide software that potentially allows a medical facility to plug in or unplug any PACS without suffering through the data migration process or losing control of the data. Data control is an important issue. PACS vendors have been able to charge considerable sums because facilities can’t function without access to their data, keeping that data a proprietary archive makes a vendor more difficult to replace. Data control and access affects everything from patient care to billing and, moving forward, data-mining initiatives as well. Separating storage from other PACS functions represents a significant shift in bargaining power from vendors to customers. The increasing interest in VNAs may seem to herald a new era in medical image management, but the change may prove more evolutionary than revolutionary. Chang says PACS vendors have come to realize that their value is in workflow. As long as the PACS helps radiologists do their job, it makes no difference where the images are stored. As has happened with other PACS components, such as networks, workstations, and graphic cards, it is becoming apparent that one archive is as good as another as long as there’s a reliable way to retrieve the images when they’re needed. Chang believes this change in archiving will facilitate greater interoperability and lead to even bigger changes in medical image management. But he points out that PACS vendors have taken notice of the rise in VNA popularity, and he doesn’t believe they’re ready to cede the middleware ground. However it’s handled, the idea of separating PACS functionality from the archive is gaining traction. Freedom from data migration alone would make people sit up and take notice, but the issue of storage capacity, even in the digital realm, is a growing concern. The inexorable growth of image volumes has only exacerbated the data migration problem. And although storage prices are continuing to decline, that doesn’t mean there are no limits to availability. Koller says newer multislice CT scanners, MRI, and other imaging advancements may be growing volumes faster than storage prices are dropping. Plus other departments are adding to the digital image growth, such as cardiology, or image files in other formats such as JPEG or PDF. 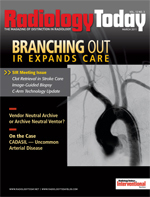 Koller says the eventual addition of digital pathology data to the storage load could potentially “dwarf” what radiology and cardiology produce, and others in the industry agree. Managing such vast quantities of data requires computing intelligence to develop rules for and apply rules to the data. VNAs make that intelligence available to medical facilities. Among other things, the facility can decide how to categorize the data, where to store it, and when to purge it. The need for this type of intelligence is quickly becoming essential, not only for clinicians, but for administrators as well. Koller says because of cost constraints on hospitals, they can no longer afford to manage data islands. To do this, the IT department will need to assume a larger role in data management. Koller says data need to be managed as a business asset rather than just a clinical asset, and he expects VNAs to evolve as business needs change. For that to happen, the rules that are put in place today must be able to address issues that come up in the future. This type of intelligence will allow medical facilities to respond more effectively to unforeseen events. Of course, this begs the question of what happens if a facility decides to switch VNA vendors. Wouldn’t this result in a painful, PACS-like migration problem? Possibly, but not necessarily, says Shannon Werb, chief information officer (CIO) and chief technical officer of Acuo Technologies, a VNA vendor. Werb adds that Acuo provides data migration capabilities for customers who want to switch to another solution at no extra charge. The migration capabilities are an embedded, native component within the VNA. Still, he says, it’s inevitable that the playing field will change. Because there are currently very few products that can manage data in this way, VNAs provide a bridge to whatever comes next. He says next-generation storage devices will probably be more Web services-based and ultimately standardized, allowing easier access and management, but those solutions don’t exist yet. One area where VNAs seem likely to play a greater business role is in helping facilities achieve meaningful use. Although there are no meaningful use test criteria associated with VNAs today, Werb believes there eventually will be. He says all VNA manufacturers are responding to customer inquiries and preparing for possible meaningful use certification down the road. In the meantime, he says VNAs can act as enablers for meeting requirements, primarily through enabling image sharing across applications and through an EMR. Further down the road, the emphasis on meaningful use may give way to demand for personal health records. Because EMRs are set up to meet the needs of medical facilities rather than patients, such an undertaking might prove difficult. Effective data management will be integral to the process, which may provide opportunities for VNAs. Going forward, Chang believes more PACS companies will try to incorporate management middleware into their offerings, either by partnering with VNA companies, buying VNA companies, or developing their own solutions. He says this strategy will allow vendors to focus on what they do best and will produce better results for customers. In the near term, it’s not clear how many customers are considering VNAs. Jeff Timbrook, CEO of Acuo, estimates that 25% of organizations looking for a new archive solution will choose a VNA over a traditional option. He says interest has been evenly split between community-based hospitals and multifacility medical centers. “I think we’re coming out of the early-adopter stage into the early-maturity stage,” he says. Whatever role VNAs ultimately fill, it is clear that sharing images across an entire medical enterprise will be a necessity. Due to the various demands for data access, IT departments will be medical facilities’ gatekeepers. Because medical IT is far behind other industries, Chang says the medical informatics community can and should learn from early IT adopters, which will speed up the process of medical image management modernization.